I’m told Ayam Masak Merah is a ubiquitous dish at Malay buffets back in Malaysia but I honestly don’t remember ever eating it. 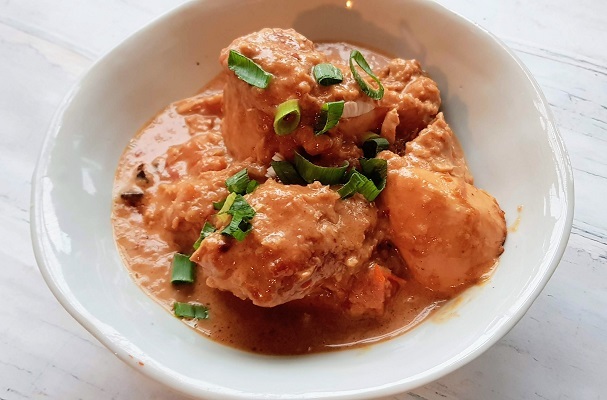 It could be that my home state of Negeri Sembilan serves up a Malay fare that’s noticeably different to that found in other parts of the country. For the longest time after it appeared on my radar, I wasn’t particularly compelled to try and make ayam masak merah, because frankly it just sounded and looked like glorified chicken and tomato ketchup. That was until one of my private cooking class students recently asked me to teach her, at which point I figured I probably should look into it further. As is often the case, when doing recipe research I go for the ones written in the language of the dish’s origins (that’s about the extent of the usefulness of my B.A. in Languages degree). 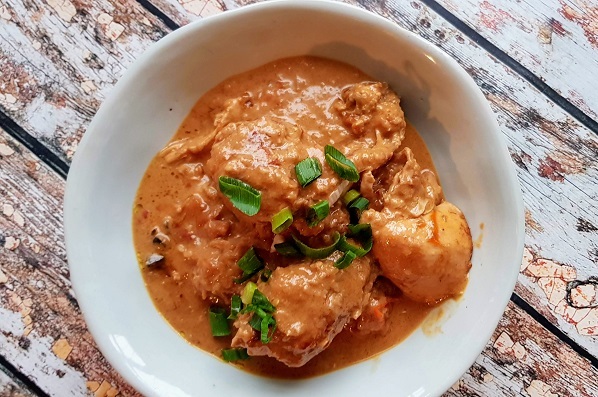 I found one that described itself (in Malay) as the best Ayam Masak Merah recipe ever, tweaked it substantially, including quadrupling the amount of coconut milk (I like my food rich and creamy), and cooked it up with my student. She was blown away by how fabulous it tasted, so I’ve decided to share it here. Rub salt and turmeric powder on chicken pieces, then deep-fry or pan-fry briefly in hot oil to sear. Remove the half-cooked chicken pieces and set aside. Remove oil, then combine processed ingredients and fry gently until most of the moisture has evaporated. Add 3-4 Tbsps oil and fry until oil separates. Add sliced onion, bottled chilli sauce and chicken pieces. Mix well and allow to simmer. Add water and coconut cream and simmer further until thickened. Add tomatoes, tamarind concentrate, chicken powder and sugar. Cook until chicken is cooked through and the dish is a nice red hue; adjust seasoning, remove from heat and serve with rice.